WHERE TO BUY GRACE ORGANIC, click here for a retailer near you. People love coconut and cook with it every day. Coconut is a nutritious superfood packed with fibre, protein, minerals and vitamins. 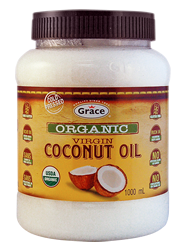 Grace brings you a full lineup or organic and natural coconut products.